Sheitel or Tichel – Is There Even A Question? Hi! Welcome to my blog! Maybe you came to read about the hot-button topic of sheitels vs. tichels, but you are certainly welcome to stay and read a little more about the truth about feeding small children, maybe get a little inspired by a shift in perspective, or just laugh about the time I had to disassemble my oven. If you like what you read, you can sign up for posts via email (in the sidebar there). I post about once a week or once every two weeks, so your inbox won’t be flooded by my presence, no worries. Or you can follow my Facebook page, which is more active. Whatever works for you! Enjoy! The two top posts on this blog are from three years ago when I wrote about covering my hair with a sheitel and with, well, everything else that isn’t a sheitel. Sheitel and tichel are two of the top search terms that lead people to my blog, even though I have barely blogged about those topics. But I get why they are big topics. Covering one’s hair is a huge mitzvah, and one that is not always so loved. Andrea Grinberg, the woman behind Wrapunzel (remember when I was a Lady Wrap Star over at her blog a bazillion years ago? ), has been bringing the love to hair covering. And people are so, so into it. She and her lovely sister-in-law Naomi Rose (clarinetists represent!!) were just here in Cleveland on Sunday, and I was so happy to attend her event. Not only did I get some gorgeous new tichels, including this one, but I was inspired to reflect on the evolving relationship I have with covering my hair. In that sheitel post from the past, I mentioned that I liked to wear sheitels if I felt like being incognito. I would wear them any place where I felt like I didn’t want to stick out too much, a place where maybe there wasn’t going to be a large Jewish presence, or any Orthodox presence. Well, things have changed. Over the past few years I have noticed a shift in attitude in how I want to present myself to the world. I have definitely moved more toward the side of tichels. When I would be out and about with a sheitel and happen to see a Muslim woman with her hijab, I would feel a little twinge of regret. It seemed like she would be obviously (and usually stylishly) declaring herself to be connected to G-d. And there I was, blending in. It wasn’t easy to break out of the habit of wanting to blend in, though. The first time I wore a tichel to a doctor’s appointment I was a fairly self-conscious. But the second time was easier, and by the third or fourth time I didn’t give it a second thought. On the rare occasion that I would need to go to the mall, I would always put on a sheitel. But not anymore. Now I will deliberately wear a tichel. This shift can also be seen clearly through how I’ve presented myself online. When I did my Partners in Torah video stint, I was always, always in a sheitel. When I did my Quick Thoughts for Elul video series, more often than not I was in a tichel. I also think it’s a lot more palatable to explain hair covering when I have a scarf on as opposed to when I’m covering my hair with other hair. I don’t even really get that, especially when my sheitels look so amazing (though articles like this do a good job explaining that, though). If I weren’t covering my hair, there is no way I would look that nice! I would be in a permanent ponytail, or a short cut (not that ponytails or short hair can’t look nice). I still wear my sheitels on Shabbos or if I’m going to a frum event where nearly every woman will be wearing a sheitel. My husband does like the way I look in sheitels, and I don’t mind them so much, really. I like the way I look in them, too. And if you feel more comfortable in a sheitel, then rock it. But I love the way I look in tichels. And I love how they are never in my face when I’m playing with my kids, or when the wind blows. And how I can fry onions in a tichel and not have to take it to someone else to get washed like when I fry onions with my sheitel on. When I wear a tichel, especially a very pretty one, I feel like I am proudly announcing that I love the mitzvah of covering my hair. Hopefully I’m also inviting conversation, creating curiosity, and making a kiddush Hashem. The only question I have is: Will I ever come to a point where I completely do away with my sheitels and go full-on tichel all the time? I wouldn’t be surprised at all if (when?) that happens. What about you? What’s your preferred hair covering, and has your relationship with it evolved over time? So, Rivki, you’re switching sides? You traitor, you! (kidding). Seriously, I really thought you were in Team Sheitel. I mean, I know you sometimes veered into Team Tichel (it even has alliteration), but you can’t abandon us Sheitel Shvitzers….we just don’t look as cool as you do in tichels….our faces are too round or too large and we are too old….oh whatever! Hahaha! Well, if I can be called a Sheitel Shvitzer than I totally will stay with feet in both camps! I’m a tichler all the way. I like sheitels, but they’re just not me. I think so much of it is finding our comfort zone, you know? While I’m not yet married, I have explored a lot on this subject. As a personal preference (without wearing either yet, mind you), I lean towards tichels for aesthetic reasons. In re:why cover your hair with more hair? Well, I’ve also looked that up a lot. Especially being Chabad, where the Rebbe, obtm, was very adamant about a sheitel versus a tichel. He even says, please! Wear a beautiful sheitel, it’s about the mitzvah of covering one’s hair, and when your hair is covered with other hair, it’s still covered! Because the Rebbe said to wear a sheitel in public, iyh when I get married, that’s what I’ll do. I think that every woman should weigh out the pros and cons of both and come to a conclusion that fits them. It’s a beautiful mitzvah and I’m glad we have so many options! I was once in a conversation with a woman (who only wears tichels) about wearing tichels vs. sheitels, and it turned not so good. This is pre-exploration I noted above, mind you. We were speaking in shul (during hakafos, so much dancing, us ladies were talking on our side while watching the men/husbands/children. Someone in front of us heard us, and I really didn’t feel good about it, and now extremely regret it. I am making a point to apologize to her the next opportunity I get. And while I know that this is not your intention, nor how your post should be taken, I just wanted to note that we should all respect everyone else’s decision. Sometimes I have too much of an opinion and learn the hard way. Usually, I then switch teams on the subject also! Thank you for such a thoughtful comment! I absolutely agree that everyone should explore what works for them and not demand that everyone should only wear one or the other. That also puts me off, and I do hope that I was clear that even though I don’t feel sheitels are so much for me right now, they are totally fine for someone who wants to wear them! The point is to enjoy covering one’s hair, I think. But I can see how my comment on covering hair with hair being difficult to explain to people sometimes could be taken as a criticism. It’s not really meant to be, just has been my experience. It’s beautiful to have a mesorah with this, and IYH I’ll love seeing you in your sheitel in the future. I’m a tichel person, for several of the reasons you mentioned above, although I also do wear hats. I’ve never even owned a sheitel, even though most of the women around me wear one daily or almost daily. The biggest change over time is that haircovering used to be something I did that was just a job, one that I didn’t mind, but that I was pretty pareve about, like washing my hands before hamotzi or something. I was happy to do a mitzvah, and agreed with what it represented, but it wasn’t terribly exciting for me. Since the whole Wrapunzel/fancy-French-mitpachat thing, I feel like covering has become an outlet for my creativity and personality. Picking my tichel in the morning is now a source of joy for me, and that really makes me feel that whole “bas melech” thing more. I had no idea you were a tichel person! What a fabulous revelation. What a zchus these ladies have for bringing so much joy to an otherwise joyless mitzvah. I also feel connected to the bas melech concept when I wrap. just an interesting sidenote: autocorrect wanted to change melech to mulch. Oy. I think there should be an add-on to add to autocorrect for people who use Hebrew and Yiddish terms. Aesthetically speaking, I like sheitels a lot. Practically speaking, I find them to be prohibitively uncomfortable. I’ve tried different kinds over the years and had no luck with them. My covering of choice is now a crocheted cotton beret. I make them from my own pattern. They’re relatively cool and comfortable (they let my scalp breathe! ), I can make them in any color, and they fit my oddly shaped head. I love berets, too. And I love that you have complete control over your berets! Nice. I have worn tichels, hats and crocheted caps of my own design for almost 40 years. I’ve never worn someone else’s hair on my head except Purim. I have very chareidi cousins whose simchas I go to wearing a tichel — or 2 — and always get compliments on how I look. I personally have a problem with how expensive and extravagant sheitels have become. I’m well aware of what the Rebbe said but some how I doubt he had some of these very expensive wigs in mind when he poskined. The mitzvah is about being tzanua (or tzinus) and showing our hair only to our husbands, of looking our best only to our husbands. I’ll admit to leaving some hair out in front for vain reasons (a yetzer I’m still fighting) but what people see is the hat or scarf or cap I’m wearing, not a head full of — once — beautiful hair. I’ve had discussions with people on this topic and I fully respect another’s choice just as I hope others’ respect mine. It is certainly a complicated topic, and even with scarves I struggle to look my best only for my husband. Often, he’ll come home late at night after I’ve been with my kids all day and all I want to do is wash my face and put on a comfy chenille snood. Okay – here are my thoughts: FIrst of all, I love the look of tichels — and I’m even talking about old fashioned tichels – you know, the kind my mother wore to the pool in the summer or around the house before she had her coffee…my mother called it a “turban” – it was very easy and slipped on and looked very good on my mother—- that being said, I wore what was called “kafiya’s” when I first got married and other such “tichels” and “snoods” which are not very pretty came out after I was married a few years. Those are ichy (sorry – not a very nice word) except the small snoods that don’t hang down with the little knot at the top – those are okay but only to wear around the house. Okay, so back to the sheitel versus “tichel” — aka pretty “scarf” or “Pashmina” — because that’s what you gals are really wearing. Not tichels….anyway — not important the wording —- it’s not a sheitel. I, for one — look disgusting (as my 4-year old grandson says the word — “esstussting” —-) but I digress…my forehead is very high and they keep slipping back (unlike sheitel which has bangs) and also my hair comes out and I’m not so handy or arts. And I need to wear a lot of makeup to look half decent in a scarf…..I can sort of kind of get away with not so much makeup when I wear a shetel, and with sheitels I can have 2 or maybe maybe 3 tops, so with tichels (oops scarves) I would have to have a bunch — to match different outfits…it’s so much easier to get up and put on my sheitel. So that’s my dissertation on sheitels. Kol hakavod to all who look great in Scarves —-they are really nice on them. MY daughters-in-law (2 out of 3 of them) wear tichels/scarves etc… a lot, and they look great in them…. I love your dissertation! And I love how your grandson saying esstussting. It’s the cutest when they don’t get the words quite right. To be honest I don’t understand this at all. If you’re supposed to keep your true beauty only for your husband then why wear a wig (that’s essentially what it is, right?) that could possibly be more beautiful than your own hair? And I know people who wear wigs that you can’t even tell are wigs so no one would know that wasn’t what you looked like. Then if it were me, I would end up looking all frumpy after going home and taking it off. Wouldn’t that be counter productive? I would think covering your hair with something other than a wig would actually seem like a more true representation of the commandment. And sadly it’s very difficult for me to read any of those other reference links because of all the Yiddish or Hebrew words I don’t understand. This is such an excellent question. I’m so sorry the reference links were inaccessible! Here’s an article I found which is totally accessible, and I think gives a good answer. I added it to the reference links in my original article on wigs. Basically, the mitzvah (commandment) of covering our hair is to keep it private, to create a boundary through our modesty. The act of covering itself does this, even when it’s with a fabulous wig. Now, there are some rabbis who think that an especially attractive wig isn’t a true representation of the commandment, like you said. There are some rabbis who say women shouldn’t even wear wigs at all. Then there are others who will say that, no, a woman should absolutely wear an attractive wig because we are supposed to fulfill the commandments with joy, and many women will not feel joyful if they feel less attractive with what’s on their heads. This is a classic case of differences of opinions in Jewish law. It happens pretty much all the time. As for the frumpy hair dilemma, most women in my circles keep their hair covered even at home (and some even while they sleep! ), so it’s not really an issue. Love this post! For myself personally, I am a dedicated shaitel wearer. Because I had to wear them all the time when I first got married (worked at a law firm those first few months!) they are more comfortable to me physically. I also find that I don’t like how I look in tichels, and I always feel much less feminine even in a pink sparkly tichel! I also worked at a law firm the first few months of my marriage. Did we ever have a conversation about this parallel? I kind of feel the same way about fringe bangs on sheitels. I love the way it looks on other people, but not so much on me. Ha! Personally I’ve done hat, sheitel and now tichel. I hope one day to look great in a tichel lol but when I can afford another sheitel I’ll get one. I’m Chabad and want to follow the Rebbe but it’s too expensive right now. Haha about looking great in a tichel. It took me a while to get used to looking at myself in the mirror with one, honestly. It didn’t feel like “me” for a while. Sheitels are really so expensive, it’s a shame. Hatzlacha with the tichels until your next sheitel! I’m on the scarf side but last week I wore my sheitel for the first time in nearly a year: I had a job interview. I used my English name and had hair. It was a sink or swim moment; I need a job. In this time of diversity I still didn’t feel I could wear my tichels. Maybe… some day…. IY”H, I hope you get the job! I’ll daven for you. If wearing the sheitel and going with your English name made you feel more confident during the interview, then that seems like absolutely the right decision. My English name is still my legal name, so it’s on my checks and what I use for all my doctor’s appointments etc. Whenever they call my name (it’s Erin), I always have to remind myself that they’re talking to me, haha! Hey, that’s also a pretty name! I think so too! I’m lucky that I like all my names, hehe. “My English name is still my legal name,…” Me, too. Scarf or sheitel I’m still me. But I’m Batya; “she” isn’t me. I’ll take the paychecks made out to her though (heh-heh)! Thanks for the good thoughts. I was definitely more confident. I’ll find out tomorrow iy”H. I am so curious about the interview! On shpilkes! I hate sheitels. I wear one because we’re Chabad. But it’s starting to show signs of needing to be replaced and I find myself extremely loathe to pay so much money (that we don’t have to waste, and if we did, I would want to spend it on other things) on replacing it. If I could do it easily (without too many explanations, questions from others, guilty feelings, and questioning whether or not I’m really Chabad), I definitely would. Maybe one day, I will. I don’t know, though. Is there a sheitel consignment place anywhere near you? The most recent wig I purchased was on the less expensive side (it’s ridiculous that less expensive is still hundreds of dollars, but, sigh, such is the system right now). But since it’s harder for you, you probably get way more schar. I don’t think so, but maybe. The thing is that $300 is about 1200 shekels. Which is a whole lot. Schar? Interesting. I can’t remember the last time I thought about schar (although I do think about onesh, interestingly enough). I just kind of do it because I have to. Not sure why I have to, though. Please don’t take this the wrong way- but the point of covering our hair is so that we should look married and that we upgrade our tznius level as a married woman. That is why there have been so many Gedolim in the past and present who forbade the use of wigs and the minority that did allow a wig did so under certain circumstances and only for wigs that looked wiggy. If you research the history of wigs you will discover that until about 200 years ago, all married Jewish women wore tichels. There were decrees in Europe that did not allow Jewish women to cover their hair with kerchiefs so the Rabbanim at that time decided to permit the use of wigs (very unnatural looking ones) as the lesser of the two evils (going around bare headed). The custom stayed and developed in to the wigs we wear today- which no Rav would have given a heter to 200 years ago. I’ve spent a lot of time researching the topic and speaking to many Rabbanim and I’ve discovered that it is really a big cover up. I’ve been told that of course the tichel is the ideal head covering but many Rabbanim are nervous to talk about it because they feel the generation is weak and it might push women away. And they all agreed that the wig has to be very modest, it has to look like a wig. It can’t beautify the woman- what would be the point of a married woman covering her hair with hair that makes her look nicer than she did when single? The head covering is supposed to create a barrier between a married woman and other men outside of her husband- how does a natural wig accomplish that? It’s incredibly hypocritical and honestly, it just doesn’t make any sense which is why it’s one of the first question asked by women when they are becoming religious. There’s a great book which delves in to the mitzvah of kisui rosh and explains the purpose of why we cover our hair and what our head covering is supposed to look like. I highly recommend it as there seems to be so much confusion on this topic – it’s called The Unique Princess by Rebbetzin Tehilla Abramov. I have a lot of friends who read the book who felt it really helped them understand the mitzvah of covering hair. Wow! You sure are passionate about this topic! I’m so glad you get so much joy in your tichels, and that you included so many resources in your comment! Thanks! I’m going to reply to both your comments here. I appreciate the extensive history you bring to the post. The history of sheitel wearing sure is an interesting and sometimes surprising story, and I always love learning about the root to various customs we follow. One point I don’t entirely agree with is the idea that a wig can’t beautify a woman. Maybe it’s quibbling with semantics here, but is beautifying the same thing as flattering? I think that there are very tznius wigs which are flattering. I think there are very tznua outfits that are also flattering. I’m thinking of a rebbetzin who told me about how a bas melech should be attractive but not attracting. I think there are wigs which can definitely meet that criteria. Yes, it’s a madrega to wear a wig like that, but some ladies do. I appreciate that you added in your second comment that you don’t intend to offend. I personally was not offended at all (so no worries about me! ), but I was slightly taken aback at the very strong tone of your comment. I can hear your passion for this mitzvah loud and clear! And that is, generally speaking, a good thing. I think it’s better to be on fire for something than not feeling anything, you know? But the tricky thing with the internet is that even the most well-intended strong words can raise hackles, and sometimes even have the opposite effect of what is desired. IY”H, I hope that anyone reading your comment will be able to see the beauty of your passion in it, but not be offended if their own avodas Hashem with this mitzvah is in a different place than yours is right now. I really, really liked the comment you made about how wearing a tichel in a sea of sheitels isn’t immodest. That’s a concern I’ve heard raised before. And even a psak that more than one woman I know received from a Rav when they asked if they could only wear tichels – they were told that since everyone else wears sheitels, it wouldn’t be tznius. But I think that times are changing in that regard because there are a lot more women who only wear tichels. As far as the idea that everyone should wear tichels, I’m going to respectfully disagree with you here. When the chashuvah Rebbetzins of American community are still wearing sheitels, I’m not going to say that they’re doing something wrong, you know? I think that this is one area where there is a difference of opinion, a holy machlokes. And when Moshiach comes we’ll have more clarity on the topic. Until then, no matter if we’re covering with a tichel or a sheitel, may we do it b’tznius and b’simcha. Thank you again for sharing your passion and your knowledge on this topic! I am very passionate about the topic of kisui rosh! I definitely don’t mean to come across as sounding strong but the info I discovered while researching the topic really blew me away! There’s a lot of misinformation being spread about the topic of wigs and tichels and I think it’s important for women to read about the actual history and facts- and what the Gedolim had to say about the topic. “The posek hador, our generation’s great halachic authority, Maran Rav Yosef Sholom Elyashiv, shlita, has clearly stated that in his opinion it is preferable for a woman to cover her hair with a kerchief rather than a wig. He constantly sxpresses his concern about the use of wigs that are not modest- a practice which, he says, has made inroads into the families of pious men and roshei yeshivah. “Women’s hair is considered ervah”- yet various posekim allow women to cover their own natural hair with a wig. As long as they have followed the technicality of covering their hair, they are not in violation of halacha. In some circles, it is expected that married women wear wigs, if they do not do so, they are considered to be religiously deficient. Does this make any sense? Women will spend thousands of dollars to buy wigs that often look better than their own hair. They will wear these wigs, which can be quite attractive, and be considered to be within the laws of tseniut. However, if a woman “wears’ her own hair, in a modest fashion, such a woman is deemed (by many) to be in violation of halacha. If a woman’s hair is indeed nakedness, how can it possibly be permitted for them to wear wigs- also made of hair? Would anyone suggest that a woman is permitted to wear a skin colored dress that is printed with a design of her private body parts? Of course not. Such clothing is obviously anti- tseniut. Likewise, if a woman’s hair is nakedness, covering it with a wig is anti-tseniut”-A Modesty Proposal: Rethinking Tseniut by Rabbi Marc D. Angel. Interestingly. Rabbi Angel of Congregation of Shearith Israel of New York City (although I think he might have recently retired), allows women to wear pants and short sleeves as long as the clothing is loose and not tight or flashy or provocative but does not consider a wig to be a proper head covering. He suggests that women wear hats or other head coverings if they choose to cover their hair! He actually wrote- The wearing of wigs does not constitute a proper head covering for those married women who wish to cover their hair! There are many Chashuvah Rebbetzins that do wear wigs- if women wear wigs that look like wigs, not like natural hair, than that is halachically permissible (but not according to everyone!). The problem is that most women’s wigs nowadays look nothing like the Rebbetzin’s wigs- they have gotten incredibly natural and many are very attracting. That would actually make the wig a beged pritzus. Terms like Beautifying and flattering are tricky- if a man can’t tell if the women is married because the wig is natural looking that’s a problem. The head covering is also supposed to make a statement that the woman wearing it is unavailable to others -that the beauty of her hair is reserved for her husband only. Many of today’s wigs don’t accomplish that – in fact they do the opposite! Oy- I’m sorry that I’m sounding strong again! I think anyone truly interested in learning more about the subject should read “The Unique Princess”. It explains a lot! I think that you’re amazing for trying to wear tichels and you are definitely making a huge kiddush Hashem by doing so! Your blog is so intelligent and so insightful- I really enjoy reading your posts! My previous post was written with no intention to offend, I am not a fanatic sheitel bashing person ( I actually used to only wear long beautiful wigs until about three years ago when I started reasearching the topic and I realized that there is a lot of info women don’t know about in regards to head covering). I’ve just been encouraged by some very holy Rebbetzins that there is an obligation to share the info with women, especially those that seem open to hearing the emes. And there is definitely a tichel movement going on! It started way before wrapunzel and it was happening among small groups of women in various frum communities who felt the sheitel made no sense (or at least most of the ones that are worn today). Where I live at least 20-30 women have been trying to upgrade in this mitzvah and there are many more in other communities- this was all before wrapunzel developed! The mistake that many pple make is thinking that if they speak negatively about the sheitels they are judging others and it’s wrong and not Judiasm and it causes divisions- it’s not true! A super holy Rebbetzin told me that it’s very important to acknowledge a problem but without judging the person doing the error. If many pple were mistakenly eating trief wouldn’t you want to let them know that they are eating food that isn’t kosher? You’re not judging them as bad pple, You’re giving over important information- info that is important to keeping Judiasm properly. She also told me that unity doesn’t mean serving Hashem together in the wrong way- it means being united in serving G-d according to the Torah! There was a very emotional speech that was given by Rebbetzin Bashie Twersky (whose husband was one of the kedoshim of Har Nof) at an asifa for thousands of women in January. In her closing remarks, she begged women to cut their wigs. Following her speech was a powerful speech by Rabbi Ephraim Wachsman about sheitels and how it’s become such a mockery of the mitzvah and he talks about women who try to wear tichels- how everyone should be mechazek them and aspire to that level of yiras Hashem. I have a transcript of the speech if you would like to read it. Or you could call Chazak at 718- 258-2008 option 9 then 3 or Inspire by wire at 718-906-6451 option 3 then 2 to hear the speech recorded. If you press 6 you could skip ahead 5 min to get to the end where it’s about sheitels. There’s also a book coming out this summer by the author of “Daughters of Dignity” solely about the mitzvah of kisui rosh- it’s fantastic! It’s not for the faint of heart because it’s the pure truth and the reality is most women don’t want to hear that there might be something wrong with the wigs they are wearing. But it’s the emes- I actually loved my gorgeous wigs as did my friends, but I can’t do something that i love that g-d doesn’t! We are supposed to serve Hashem joyously, but it has to be according to tznius and the Torah, not our own hellenistic desires. So I learned to find joy in tichels and I really do love them now! I’m not Orthodox/Hassidic/Haredi, I’m a Reform Jewish woman living about 30 minutes outside of the desert in Southern California. However, I dress according to tzniut, not easy when the weather is swelteringly hot nearly all the time. I joke that most of the frum Jewish populations have it easy, in that summer is only 3 months out of their year, where it is nearly the entirety of mine. 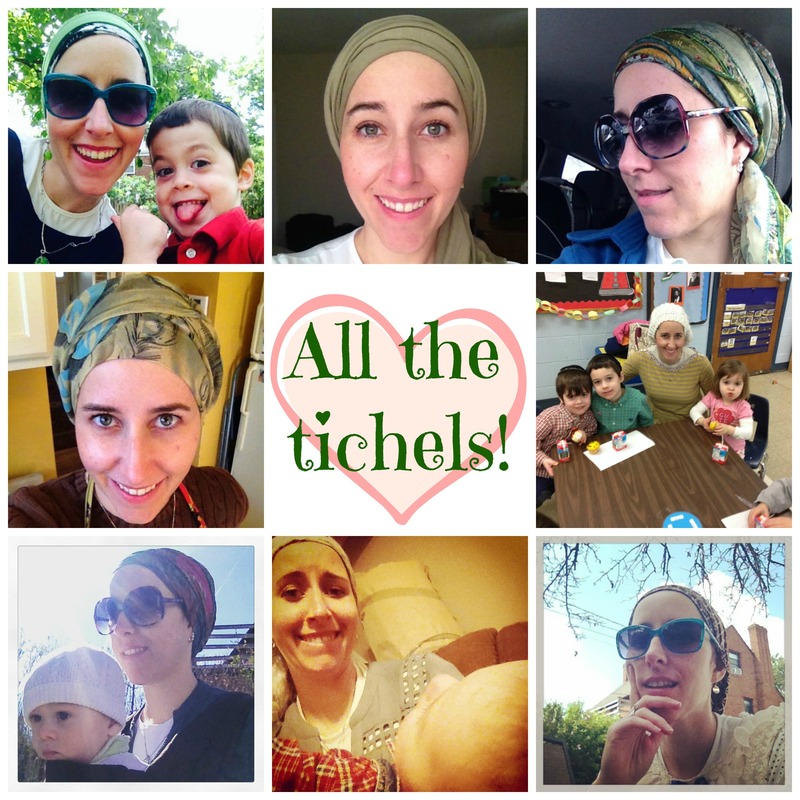 I have covered my hair since my marriage in one of two ways, a full on tichel wrap with volumizer or a simple kerchief tied around my hair while it’s in a very tight bun. When I’m not planning on leaving the house, my hair stays down, but I keep a snood near the door in case of the unexpected (because let’s face it, the unexpected happens constantly). I don’t wear sheitels for a few reasons, none of which are based around competitive piety over who is more modest, more tnziut, more whatever. The first reason is that the wigs are too hot, no matter if they are human hair, synthetic hair or a combination of both. If I put a sheitel on my head, where I live, garunteed within a few hours or less I will have sweat dripping down my face. Which is so not a look I’m going for. If you can’t be physically comfortable fulfilling a basic mitzvah, then that mitzvah becomes a resentful battle between you and Judaism and in extreme cases, you and G-d. The 2nd reason is the sheer expense. These sheitels are insanely expensive, unless you want to look like you have a cheap pile of plastic strands on your head. The cost to maintain them even more so at times. In fact I find these prices to be almost predatory. These people know that we Jewish women have no choice, we MUST cover our hair after marriage, and thus, if a tichel isn’t for you, they have you in a corner. You have to pay the exorbitant prices for the wig and it’s upkeep. I think of it in the same way I think of those paycheque advance places, financially predatory. I guess you could say I wear tichels in protest of such insane practices. The 3rd and final reason is purely aesthetics. I like having tons of scarves I can tie in different combinations to match my outfits. With sheitels, you get one look and one look only. Also, for me personally, I don’t feel as connected to the mitzvah and to my marriage vows while covering my hair with someone else’s hair. When my day is going down the drain and I need to feel that my husband is in my corner, no matter what, I reach out and touch my tichel and there he is. I’ve never felt that with a wig. However, that is a personal preference of mine only and I don’t feel the urge toget upset about sheitel wearers. I just always assume that they have more money than me. There are movements to return to cloth-only coverings. Join the movement! A good book to read is “Adorn with Dignity” by Mrs. Chanie Friedman. Google it. This is all consistent with Moshiach’s coming and it’s all good. Hello Hadasah, sorry it took me so long to respond to your comment! Mazel tov on your recent marriage! You are not alone in this struggle at all! I have heard this exact concern many times before. Some people have a more sensitive head and scalp, I think. Two ideas came to me: One is that you should for sure keep experimenting with different things to cover your hair with. Have you tried lightweight berets? Or knit hats? I’ve found those can be very comfortable and don’t need to be clipped on to stay. Good luck, and please keep in touch! I understand any need for self-preservation in a world so wrought with hate. However, I just don’t understand how people can still wear Sheitel and believe they walk true. In my formal upbringing of Catholicism:Roman Rite you either Practice all or just Holy Days of Observation. I can see how it might seem like we are somehow circumventing the observance of covering our hair, but there is a solid tradition of covering hair with a sheitel, and many G-d-fearing and devout women choose this manner of hair covering. As with much of Jewish observance, there are different opinions as to what is the correct way to do something, and as long as one is following a solidly-based tradition, it’s fine. But it can be a little mind-blowing that two people can be observing a mitzvah in a completely different way and they are both considered correct! !